Week 1 of fishing league saw 17 walleyes weighed in. Dave Cornelius and Gary Roder took top honors with 3 fish caught for 14.125 lbs, including the big walleye of the night a 9.8 lber. 2nd place went to Corey Joyce and Paul Larson with one fish for 7.75 lbs. Third place went to Brennen Longnecker and Jacob Wente with 3 fish for 7.25 lbs. 4th place was Dean Broin and Jerod Zimbelman with 3 fish for 6.6875 lbs. 5th Place was Corey Heinrich and Jerry Heinrich with 1 fish for 6.1875 lbs. Rounding out the top 6 was Cody Enger and Sean Hauck with 1 fish for 5.4375 lbs. Week 2 of fishing league may have seen a record night for total weight. Josh Weckwerth and Dustin Stone weighed 5 fish for 23.1875 lbs and also had the big fish with a 9.375 lb walleye. Second place was Aaron Heinrich and Tony Malmquist who weighed 5 fish for 22.625 lbs. Third place went to Chad Jordahl and Ben George who weighed 4 fish for 16.6875 lbs. Fourth place was Jeff Randall and Ken Nelson who weighed 4 fish for 15.8125 lbs. Fifth place was Eric Spray and Adam Spray who weighed 5 fish for 14.8125 lbs. Sixth place went to Jarrod Flinn and John Cushing who weighed 4 fish for 14.3125. There were 4 other fish weighed over 8 lbs. There were 75 walleyes weighed for 205 lbs! 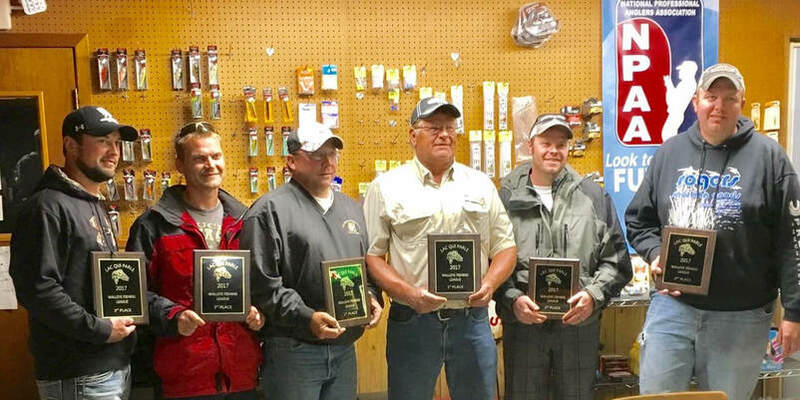 Week 3 of fishing league saw 56 walleyes weighed in. First place was Eric and Adam Spray who weighed 4 fish for 14.375 lbs. Second place was Josh Weckwerth and Dustin Stone who weighed 5 fish for 11.75 lbs. Third place was Tony Malmquist and Aaron Heinrich who weighed 4 fish for 10.875 lbs. Fourth place was Kelvin Weber and Jeri Ruth who weighed 3 fish for 9.4375 lbs. Fifth place was Pete McGinty and Patrick Miller who weighed 5 fish for 8.9375 lbs. Sixth place was Jon Jerve and Tony Omacht who weighed 4 fish for 8.625 lbs. Big fish of the night went to Corey Joyce and Paul Larson who weighed an 8.5625 lber. Week 4 of fishing league saw 47 walleyes weighed in for a total of just over 100 lbs. First place was Corey Joyce and Paul Larson who weiged 5 fish for 19.50 lbs, including the big walleye of the night a 6.9375 lber. Second place was Dave Cornelius and Gary Roder with 5 fish for 9.5 lbs. Third place went to Tony Malmquist and Aaron Heinrich with 4 fish for 8.8125 lbs. Fourth place was Dean Tobias and Ryan Streich with 3 fish for 8.125 lbs. Fifth place went to Jason Prellwitz and Sam Thomas with 5 fish for 7.375 lbs. Sixth place went to Jerry Ruth and Kelvin Weber with 2 fish for 6.8125 lbs. Week 5 was cancelled due to the weather and will not be made up. Week 6 saw 7 walleyes caught for 15.75 lbs. First place went to Eric Spray and Adam Spray with one fish for 3.0 lbs, which was also the biggest walleye of the night. Second place went to Steve Dahle and Jamie Jahn who had one fish for 2.625 lbs. Third place was Jack Anderson and Corey Reiffenberger with one fish 2.0625 lbs. Fourth Place was Sam Thomas and Jason Prellwitz with one fish for 1.875 lbs. Fifth Place was Paul Larson and Corey Joyce with one fish for 1.6875 lbs. Sixth Place was Jon Jerve and Tony Omacht with one fish for 1.5625 lbs. Next week is the last week of fishing league. Week 7 saw 19 walleyes caught for 52 lbs. First place went to Brennen Longnecker and Jacob Wente who weighed 3 fish for 16 lbs. Second place was Dave Cornelius and Gary Roder who weighed 2 fish for 8.8125 lbs. Third place went to Josh Weckwerth and Dustin Stone who weighed 2 fish for 4.875 lbs. Fourth place went to Jerry Heinrich and Corey Heinrich who weighed 2 fish for4 lbs. Fifth place went to Pete McGinty and Patrick Miller who weighed 2 fish for 3.8125lbs. Sixth place was Jon Jerve and Tony Omacht who weighed 2 fish for 2.5 lbs. This was the final night of the 2017 fishing league. Click on the standings below to view the final results for 2017. This years fishing league champions were Dave Cornelius and Gary Roder. Second place was Aaron Heinrich and Tony Malmquist. Third place was Josh Weckwerth and Dustin Stone.